The banker admits there is still worrying money on the board. Gordon says he wouldn't deal. Sam says it's tricky. £3,000 is a very good offer for the board. I'd probably go on, though. Sam says this was a tricky decision to make. Noel says the number of bad games that are consistently unfortunate is much less than the number of bad games that turn around. The banker says he foresaw this happening, but the game hasn't turned around yet. Darren says that's a lot of money. Sam tries to weigh up what he'd be more upset about if he went on and things went wrong. Noel says it used to be horrible when a game ended up like this, but box 23 now means things could turn around. The banker says he's off to the 'bah-h-h-rn'. Unfortunate result from reasonable gambling. Hopefully he won't have too many regrets. 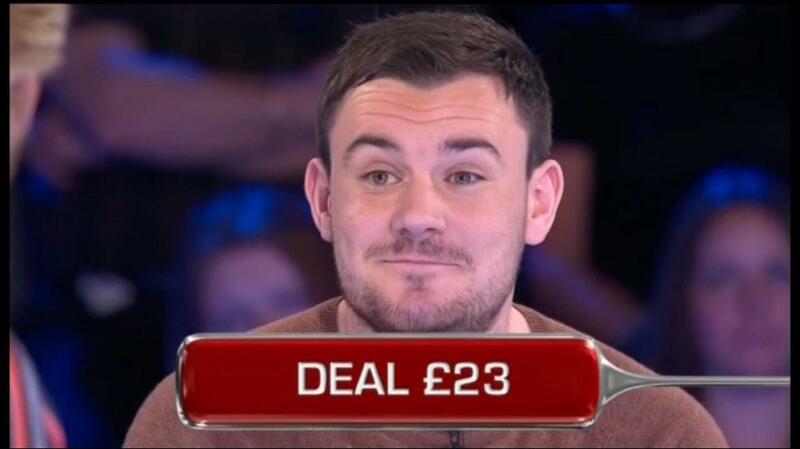 He's probably very gutted he didn't play yesterday as by declinng all the offers......£15,000! Yes! I get to use one of my 34 remaining insults. Incredibly poor play influenced by greed destroys another game. Should have been a lot less brave. I hope he has many regrets. And then there were 33.